DECATUR, Ga. — The Cooperative Baptist Fellowship has concluded a joint project of global Baptists to provide much-needed food supplies and household items to internally displaced persons (IDPs) in South Sudan. Formed just four years ago, the war-torn country with a population of 11.7 million people has been embattled in a brutal civil war that has resulted in the deaths of thousands and internally displaced more than 1.5 million people. An additional 730,000 people have fled to neighboring countries, and South Sudan continues to receive refugees from its northern neighbor, Sudan, to the tune of 250,000 people. Efforts have failed to end the civil war and violence that erupted in mid-December 2013 and the summer months have seen an escalation in violence in some states as well as widespread human rights violations. Since 2014, a project spearheaded by Canadian Baptist Ministries with the support of $10,000 grants each from CBF, BMS World Mission (formerly the Baptist Missionary Society of the United Kingdom) and American Baptist International Ministries, has distributed 600 household kits and 300 bags of food to internally displaced families staying at a South Sudan camp. 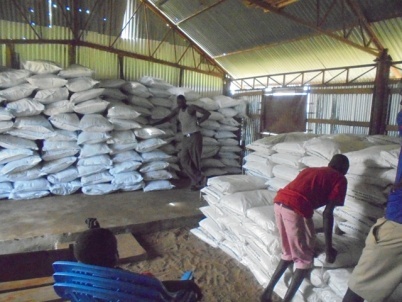 The global Baptist coalition provided this assistance in partnership with a local church in South Sudan. The household kits included blankets, cooking utensils, plastic sheets to shield the families from rain and the blistering sun as well as mosquito nets to prevent malaria outbreaks. Large bags of Unimix, an enriched maize and bean flour designed and used to fight nutrition, were provided too. The coalition put a primary focus on serving those most vulnerable, specifically the elderly, pregnant women, women with infants and the disabled. One mother, a widow whose husband was killed when tribal clashes broke out in her hometown, offered thanks for the coalition’s kits and food. “These items will help me in avoiding diseases like malaria and malnutrition. I thank all God’s people who remembered us for responding to our desperate situation by availing these relief items,” she said. A leader of the IDP camp also expressed thankfulness for the coalition’s efforts to help the displaced families make it through an extremely difficult situation.